The Lepidoptera are with about 150.000 species the second largest insect order in the world. It is probably also the most popular insect order, mainly of course by their often beautiful colours and variety. Their rather fragile structure with scales on the wings, thin legs, large wings and possession of a tube-like tongue (or not) instead of jaws, make them beloved by many people. Traditionally the Lepidoptera are divided in three unnatural groups: the micro-Lepidoptera (small moths), the macro-moths (Iarger moths) and butterflies. Butterflies are, of course, the most popular of these three. With their broad colourful wings and their day flying character they steal the attention of most people, usually already from childhood. 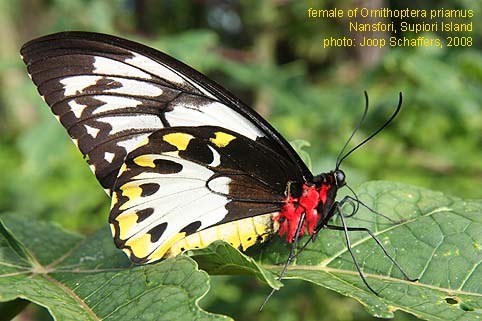 The species of butterflies are the best known from all Lepidoptera, although there are still many species to discover and their biology and ecology to investigate. Moths are less known, especially the tropical ones. Many species are being discovered every year and we are not even close to the end of it. We hardly know anything of their biology and in most cases we still don't even know the caterpillars of the species. We would appreciate it if specialists of listed or unlisted Lepidoptera families will cooperate in completing the checklist and information of the butterflies and moths of Papua. Note that families like Arctiidae and Lymantriidae are transfered to Erebidae according to the latest classification (Zahiri et al., 2010)!